CAMBRIDGE, MA — In 2010, the environmental group Greenpeace launched an online campaign against Nestle, the food-production giant. Nestle's KitKat bars, the campaign charged, contained palm oil supplied by a company that was improperly clearing rainforests. But Nestle, as MIT Professor Yossi Sheffi discusses in a new book on sustainability in business, thought it had already addressed the issue. The company had adopted a "no deforestation" policy, stating it would no longer use palm oil from companies clearing forests after 2005. In 2009, Nestle had joined a group developing industry standards on the issue, the Roundtable on Sustainable Palm Oil. Nonetheless, within eight weeks of the start of the Greenpeace campaign, Nestle dropped the supplier providing the palm oil in question. Perhaps the campaign had affected KitKat sales. Maybe Nestle executives grew weary of seeing activists dressed up as orangutans outside company headquarters in Frankfurt, Germany. (Orangutans are losing their habitat due to deforestation for palm oil plantations.) In any case, the public relations problem had become significant. But in the view of Sheffi, an MIT professor and leading expert on logistics in business, such episodes can create an overly simplistic narrative about business and the environment. Sustainability in commerce, Sheffi says, should not be regarded as a matter of "good or evil," but is typically a clash of "people versus people" around the world, who have their own different interests at stake. "It's the importance of the environment against being able to have a job and afford things," Sheffi says. So when exactly should companies pursue sustainability measures — and when is it in their interest to hold off? 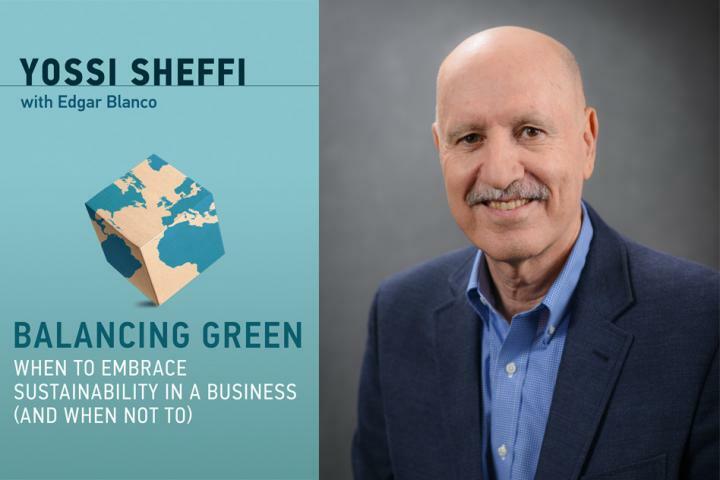 That is the question Sheffi explores in the new book, "Balancing Green: When to Embrace Sustainability in a Business (and When Not To)," just published by the MIT Press. "People say they're willing to pay for sustainability, but when they go to the checkout counter, almost nobody does," says Sheffi, who is the Elisha Gray II Professor of Engineering Systems at MIT and director of MIT's Center for Transportation and Logistics. "Or 10 to 15 percent of people do, modestly, but it's not enough to move the market." Sustainability certainly does become an important consumer issue when activist campaigns arise, however. Sheffi believes this is one factor that makes "risk mitigation" the first broad reason why companies should pursue sustainability measures. In some cases, those hazards are reputational, as Nestle experienced, but in other cases, it may be that environmental changes are affecting a company's resources. In either case, Sheffi notes, environmental inaction carries risks. "Companies should respond to pressure or be just ahead of pressure," Sheffi says. But for the most part, he adds, "I think companies should lead on good products, good marketing, good quality, and selling them to as many people and getting a good profit. That's legally the role of a company." A second reason firms may pursue sustainability measures, as Sheffi details, is cost-cutting. As the book notes, manufacturers such as Siemens and BASF have made their own facilities more energy-efficient, while beverage giants such as Coca-Cola and brewer AB InBev have lowered water consumption and thus reduced costs. The office-supply firm Staples reduced the fuel consumption of its delivery trucks by 20 percent by limiting their top speed to 60 miles per hour, and realized $3 million in annual savings from that change alone. "The main activity many companies are doing is saving energy, and saving energy is totally tied both to a reduced carbon footprint and to reducing costs," Sheffi says. At the same time, says Sheffi, "Sustainability is a supply-chain issue." And, as he writes in the book, "for many companies the bulk of their carbon footprint is generated by their suppliers and their customers." Thus it is not enough to limit a company's carbon footprint when most of its environmental impact is elsewhere. In fact, as Sheffi also writes, "without accounting for the supply chain, companies can just outsource their pollution and appear greener." A third impetus for pursuing corporate sustainability, Sheffi notes, is "hedging," as he puts it; being green might pay off in the long run if that's where the market moves. "Customers may change," Sheffi says. "Millennials are more attuned to sustainability concerns. It could be that as these people get more purchasing power, the market may change." In this vein, some companies launching green product lines — such as Clorox, with its "Green Works" cleaning products — have not necessarily cashed in, but have gained knowledge about manufacturing and marketing such products, which may be more valuable in the future. And as Sheffi notes in the book, there is a small class of firms already practicing what he calls "deep sustainability," meaning they "have always explicitly prioritized" their environmental agenda, and "sell specifically to customers who value that." For instance, among other practices, the clothing manufacturer Patagonia publicly discloses its supply chain to an unprecedented degree — you can go online and quickly learn that a favorite jacket uses fabric from suppliers in Belgium, China, and Taiwan, and is sewn by a supplier in Vietnam. Still, as Sheffi says, prestige clothing brands have more limited audiences and "are not likely to be a big multinational competing with Zara and H&M or any of the biggest sellers of clothing." In short, sustainability is difficult precisely because of the complex convergence of consumer demand and global supply systems, in a diverse world. Or, as Sheffi writes in "Balancing Green," different "people in many countries, coming from diverse socioeconomic classes and varied value systems, will not make the same choices in what they buy, what they supply, and how they feel about the confluence of environmental and economic issues. The challenge for companies is that they must bridge these wildly diverse outlooks on the world and the environment."